As one of my readers (hi there hh!) have pointed out, I failed to correctly assess the market sentiment. I focused too much on fundamentals, and did not realize that the market has been pretty optimistic about Greece’s austerity vote. Rallies were strong, while the dips were quickly erased. Despite my botched trade, I don’t feel bad. I mean I don’t feel THAT bad. Losses are normal and I stuck to my risk management rules. My account took a 1% hit, which could easily be recovered with one win. In fact, even if I lose more trades, I could get them back with trades which have good reward-to-risk ratios. It seemed like investors were as giddy as teenage girls in a Miley Cyrus concert for Greece’s austerity measures yesterday. But while EUR/USD closed above 1.4300 and almost hit my stop loss, I think I’ll keep my trade open. In my humble opinion, I think the fundamental background hasn’t really changed. The fact is, while the Greek parliament will start the discussions on austerity measures later, the failure for the government to pass the budget still remains to be a realistic possibility. Also, on the technical side of things, it seems like the pair is testing resistance at the falling trend which I drew from the highs of June 15. Stochastic also indicates overbought conditions. Sure, I may end up losing my trade, but I have considered all possibilities and the reward far outweigh the risk. Wish me luck guys. Thank you Big Pippin! I took a gander at his Daily Chart Art today and I decided to take one of his setups. I think it’s a very good one, as the risk I have to take is far outweighed by the possible profits. If I play my cards right, the trade could have as high as a 5:1 reward-to-risk ratio! As you can see, EUR/USD just bounced from the 61.8% Fibonacci retracement level. 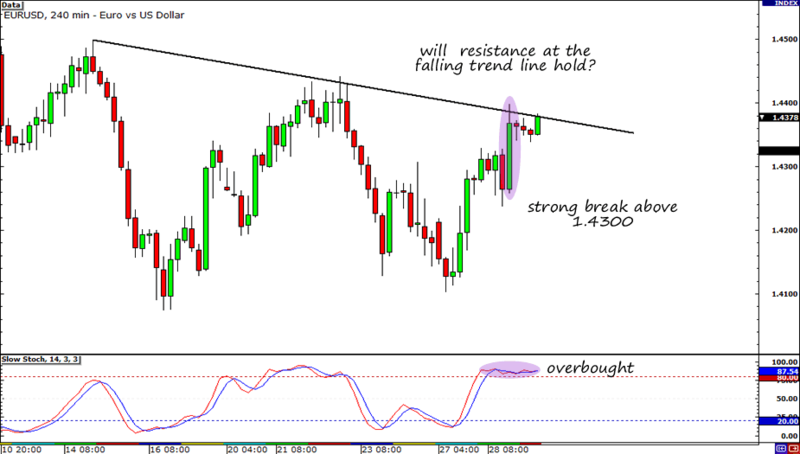 With Stochastic already in the overbought territory AND crossing over, we could see the pair start to fall. Also note that the 1.4300 major psychological number coincides nicely with the Fib level. Sweet, huh? Shorting the pair is fundamentally-sound too. Well, kinda. I think the outcome of my trade will largely depend on whether or not the Greek Parliament would agree to more austerity measures. I know that most analysts are excited to see policymakers implement more budget cuts and tax hikes. Pip Diddy has told us time and again that if the Parliament votes for further fiscal discipline, the euro would probably rally as this would ease concerns about a Greek default. However, after seeing the currency rally up the charts yesterday, I’m thinking that perhaps the event is already priced in the market and we could see a classic “buy the rumor, sell the news” move when the decision is finally announced. Or, who knows, perhaps the Greeks wouldn’t be able to come into terms with each other and spark a massive wave of risk aversion to send the euro tumbling down the charts. Hey, anything can still happen, right? On top of that, I have a feeling that the end of QE2 would also give traders one more reason to root for the dollar. 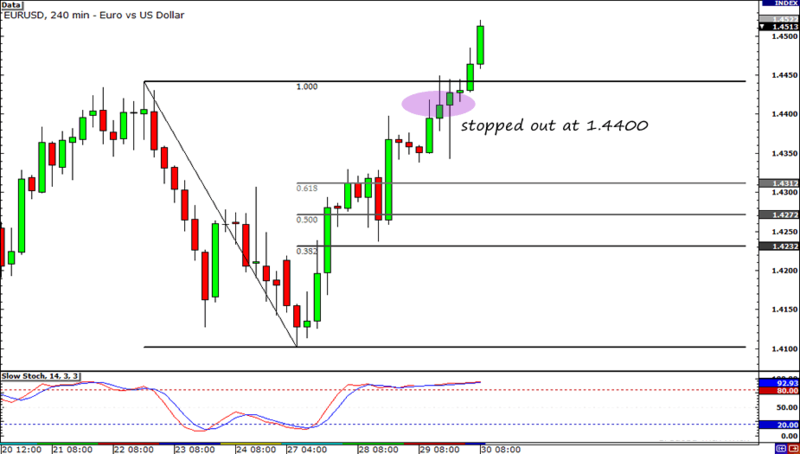 Short at market (1.4282), stop loss at 1.4400, ultimate profit target at 1.4100. I have risked 1% of my account. Since I’m going with the trend, I want to really get the most out of my trade. I will scale in and add half a position every time the pair moves 50 pips in my direction. 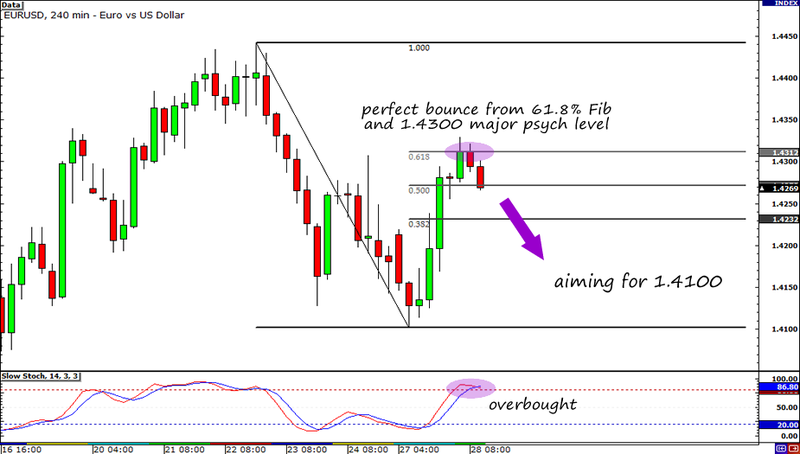 Of course, I will also move my stop by 50 pips to reduce risk as well. What do you think of my trade? Hit me up on Twitter (@LoonieAdventure) and Facebook!